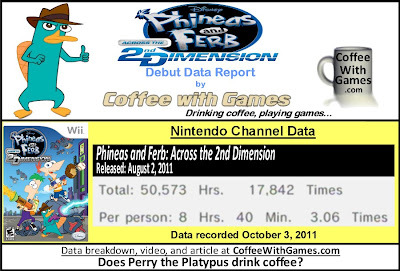 Phineas and Ferb: Across the 2nd Dimension has about 5,830 Wii owners that have reported play-time data since the game released in August. The game has 50,573 Total Hours of game-play reported on its debut, with an average play-time of 8 Hours 40 Minutes "Per person" reporting data. Phineas and Ferb: Across the 2nd Dimension's average play-time per day/session reported is 2 Hours 49 Minutes. 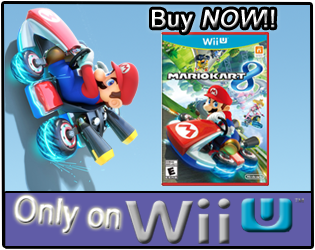 The game's current Amazon.com sale rank is #365, and it is selling for $39.96. Across the 2nd Dimension's "professional" review score average is 74.75%, based on 4 reviews on GameRankings.com. The game has a 4 out of 5 Stars rating on Amazon.com, based on 14 customer reviews. Phineas' and Ferb's latest game adventure has an 81.42% customer review score average, when the reviews are converted to a 100% review scale. Phineas and Ferb is another show we started watching through Netflix's streaming service with our oldest son. While he probably couldn't follow what was happening in the show when we started watching it, the show provided a good distraction and background noise; but like another show, soon I found we had watched all of the available episodes, some two or three times. Our oldest little bean will request to watch the show by saying, "Ferb! ", so I think he's understanding it more now. Like that other show, I also learned the theme song for Phineas and Ferb and have come to enjoy some of the characters on the show; specifically I enjoy the running relationship between Perry and Dr. Doofenshmirtz. While I have not played Phineas and Ferb: Across the 2nd Dimension, I am surprised to see the game's average hours "Per person", or console, at more than 8 hours. Tony, from Nintendo-Okie.com, reviewed it and clocked about 3.5 hours with the game, so I think the reported game-play hours show the game is definitely being played more often, and/or by more than one person; compared to Tony's time with the game. Have any of you played Phineas and Ferb: Across the 2nd Dimension, and if so, what do you think about the game? Have any of you watched the Phineas and Ferb show, and perhaps are fans of it also? Haven't played the games and can't call myself a fan of the show, but my younger two kids tend to watch it when it's on. I get the feeling they like it 'okay' but it's not a favorite of theirs as I never catch them going out of their way to catch it. my two boys absolutely loved this game.. but, they beat it in one day last saturday. if you're a fan of the show, you will love the game. 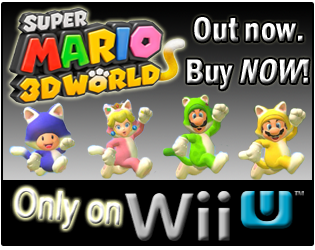 it also has lots of voice acting throughout. It's really nice in games like this that the audio's come along well enough that they can do actual voice acting for a lot of it (or irritating I suppose if you as the parent really dislike the game/tv show in question), but I think that really helps younger kids in particular enjoy the tie-in from game to show/movie. I can remember one night becoming annoyed with a certain character, repeatedly yelling her one line over and over..."MOM!" But, other than that one night, I think I have either gotten used to that part of the show, or just completely block it out now. Also, LOL at your question and poking of another reader...better be careful though, or I may have to update my TOS with a "not responsible for physical violence" line. So, being that it seems a fairly shorter game, is there any sort of replay value to keep players going back? I mean, it seems the game is playing a good bit, so I'm wondering what is bringing them back to it.